The end of November is a wonderful time for Americans. We spend time with family and stuff our faces with an amazing feast. However, after all of that food, we’ve got to get back to work to burn off those calories. For some, that just means improving the menu of tricks that they can serve up. In this edition of Top 10 Tekkers, we’d like to thank everyone involved with the football culture for building an incredible community. Saloua el Mahdiui is an ambitious 20-year-old footballer who is trying to emphasize the importance of women’s football. She’s not afraid to go up against the guys either, and at the Ajax Nemeziz Challenge event, she was the only girl in attendance. She practices freestyle for about two hours each day, and she is inspired by her two favorite players, Iniesta and Touzani. Chinese freestyler Dawnorus Liu is tuning up her game in anticipation for the ExpyStreetJam coming up on November 25 in Singapore. She definitely has some serious swag in her flow with powerful sits, and these shoulder juggles are impressive as well. 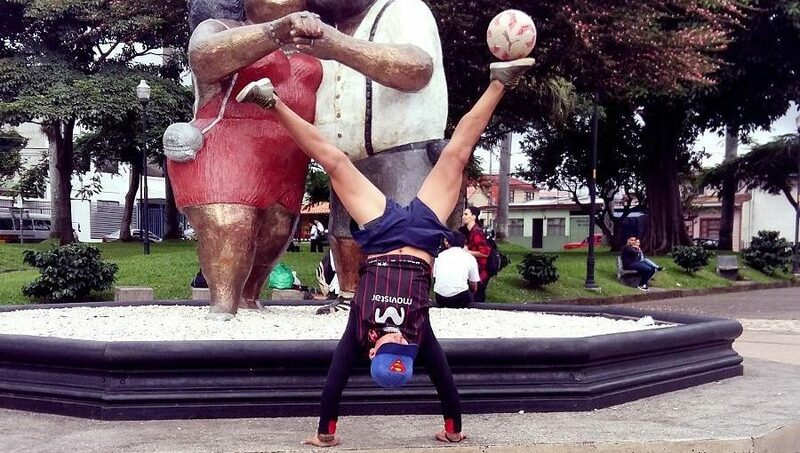 Javier Felipe Paz Revelo is a 17-year-old baller from Pasto, Colombia who gets his inspiration from his favorite freestyler, Erlend Fagerli. His background as a gymnast surely helps his freestyle skills, and he’s also built like a beast — and he’s definitely not afraid to show it. Freestyling for five years and playing football for 14, Hito is an impressive two-way baller from Japan. Both his ground moves and freestyle flow contain heavy breakdancing influence. Hito made it to the top 32 in the Japan Freestyle Football Championship in 2016. In addition, he was top 16 in both D.I.S. Football Battle and KT Street King Japan Stop. He also competed in the street football tournament for the Japan Stop and made it to the top eight. We’re taking a step back in time with this one. Rohan Singh started his freestyle journey in 2009 in New Delhi. He remembers there barely being a dozen people there who freestyled. Over the course of the next four years, he performed for various events, the biggest being the halftime show for a Bayern Munich match in 2012. Meet Sean Seng, a young baller from Thailand. Practicing ground moves is only half the battle when it comes to perfecting your skills — you need to have that creative element as well. It appears as Seng has both of those down, and he can even do both while blindfolded. Nirvank Pravin Solanki was born in India and lives in Mumbai. He practices groundmoves and loves doing his variation of the Akka. His favorite players and inspiration are Ronaldinho and Edward Van Gils. He is one of the first to play street football in his city and simply started from watching some YouTube videos on panna. Now he’s balling up on the rooftop. Here comes another young 16-year-old baller. Ayman is from Belgium but originally was born in Malaga, Spain. He has been freestyling for two years now and is shocked with the progress he’s made. After pushing past his thought of the sport being “impossible”, he has finally learned many tricks and is only getting better. Ayman wishes to compete in Super Ball next year and is trying to create his own style that people will remember him by. Wait, what!? Is this even physically possible? Just watched this about three times and my head is dizzy from it. Jeff is an obvious ninja. Who is able to do a stationary back handspring into a J-stall? I’ll tell you who — a ninja.